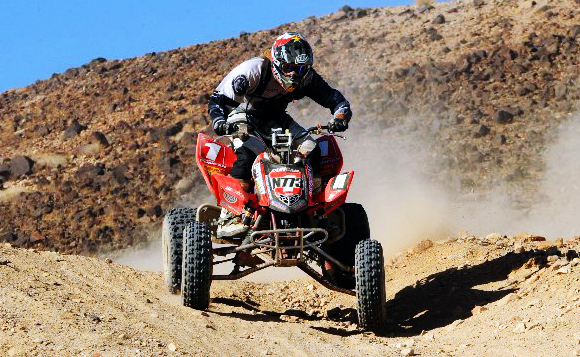 Andy Lagzdins gave DirtFirst Racing its first race win of 2012 at the first round of the National Hare and Hound Series held in Johnson Valley, California on January 22nd. It was a great start for the current NHHA champion’s title defense, and showed that Lagzdins was not only racing the series again in 2012, but looking to repeat last year’s dominant performance on his DirtFirst Racing Honda TRX450R. “It feels good to come back after the long break and find that I still have what it takes to win,” stated Lagzdins after the race. The 40 mile, single loop race was held in dusty conditions, making a good start on the 3-mile bomb run an important advantage. Andy’s Duncan National Kit equipped motor fired instantly, and powered him into the lead pack of quads by the banners. After taking over the lead, Andy missed a turn which allowed Keith Carlson to get past. Keith is a top ProAm rider in the Big 6 GP Series, and was making his debut in the NHHA Series at this race. Andy overtook Carlson on a rocky downhill before the halfway point and built up a 6 minute lead by the end of the race. “I got up to the top of a ridge and noticed that I hadn’t seen markers in a while. I turned around and saw Keith making the turn that I should have made on the previous ridge. I stepped it up a notch to get back into the lead, and carried the momentum to the finish,” recalled Lagzdins. Yamaha-mounted Bill Markel, who won the last race of the 2011 season, battled his way into second place at the finish. “My race went well. I got the holeshot and was first to the bomb. Had a good battle all day with Mark Ornellas and Chris Dobbins, and ended up second,” said Teixeira Tech-sponsored Markel after the race. Backing this year’s DirtFirst Racing Team are the familiar sponsors that have helped the team riders win championships all across the United States and Mexico. These include Duncan Racing, Roll Design, Elka Suspension, ITP Tires, RPM Axles, TireBalls, and IMS Products. Andy’s personal relationships with Moose Racing, Alpinestars, and ATVRiders.com will continue through the 2012 season, basically arming Lagzdins with the same successful package that he has enjoyed since his days racing the GNCC’s in the East. Round Two of the NHHA Series takes place in Ridgecrest, California on February 12th. For information check out www.Nationalhareandhound.com.